I thought it would be a great idea to check in on some sets that don't get a lot of press around here to see exactly how they are doing now. I love 'where are they now' editions of TV shows so if nothing else posting this will please me, and perhaps others like me. Also, I think learning from history is better than not learning history, so for new(er) members, these type of posts might be instructive at best or eye-rolling at worst. I was casually checking through my stockroom a few days ago, organizing, moving boxes around, admiring pretty sets, etc., when my eyes fell upon my admittedly small stash of #60026 Town Squares (in all fairness, I admit to only having four). I hadn't checked in on this old fellow for a bit so pulled up some eBay sold listings. I was pleasantly surprised to see the eBay trend price is $218 CAD with a few selling above that number (as of Nov. 12, 2015). This piqued my curiosity because I know I purchased these last year 20% off (plus VIP) from S&H in December 2014. For an eleven month hold I have to admit to being downright jolly about this set's performance. Perhaps it is because I was very conservative in my expectations (say, $200+ CAD 18 months after retirement or so) or maybe I am just happy anytime I 'know' I can sell a set for at least some profit after taxes and fees and such (it definitely placates my significant other as well to show her sale prices over $200 CAD so she knows this set is almost certainly going to make at least some profit). Not every set can be the Zombies or the Town Hall. I believe a solid portfolio should be balanced, and this large City set seems like it would have been a good one to add to any investor's portfolio at a reasonable discount. I know, I know, buy in is always a combative point in the forums, but I think we can mostly almost always 100% of the time agree that City sets can be found at discount at some point in their product cycle. So why has this quiet little (big) set done pretty well in the last eleven months? A short production lifespan. Brickset.com lists its availability from Aug 1, 2013 to December 2014. I can't remember the exact day, but it was post Boxing Day 2014. It lasted a bit at 20% off on Shop at Home, but not crazy long (like Kingdom's Joust at 20% off...which considering the derision some heaped on it whilst on sale, it will still eke out profits if sold today). I regret not grabbing a couple more, actually. I think I was entirely too concerned with festive celebrations and not doing due diligence to realize this run was actually well under what I will simply call 'average' (debate what average is to you in your own posts...to me it is around two years, give or take a couple months, so this was a significant difference from MY concept of average). I also was probably so full of holiday cheer that I forgot I had done quite well on 8404 Public Transport. Again, not fireworks, but bought at discount near EOL, held for less than a year and solidly collected cash. Virtual money in your portfolio isn't nearly as sweet as the real cash I got from selling my 8404's and pushing that money right back into other sets. Little buzz. I just reread some of the six (yes! all six pages!) of the 60026 discussion. It was a real barn-burner in some sections...scintillating reading, really! I posted in that thread a few times! And if you are reading this, you've already at least partially allowed your brain to think my jibber-jabber is relevant and useful to you! Also, I think if you took out the posts about the initial launch and the flurry of posts when it went on sale on S&H near the end there were possibly only a handful of other posts in the intervening 15 months. Boooo-ring! I think part of this is that (at least in Canada) it was a TRU exclusive and difficult to get with any significant discount. I seem to remember about 20% with some air miles bonuses about the best I could muster. South of the border I'm sure some of you used 'American coupon magic' (that is banned in Canada) to get your buy in crazy low, but I don't recall any massive sales on this set in my parts (which probably accounts for the rather paltry amount of chatter about this set). More expensive successor. I think having 60097 City Square come out at a higher MSRP helped 60026. I think one could make a counter-argument or argue that any successor ultimately will limit the growth of 60026 but I tend not to agree with any hypothetical naysayers. I imagine the kind of people buying 60026 over MSRP do so not in lieu of purchasing its 'replacement' (a large City 'scene', if you will) but buy it because they want it in addition to 60097. Higher values of one (at least to me) seem to go hand in hand with higher values for the other. City sets are winners! Ha! I know a multitude of BPers will disagree, but no matter! I have made solid, steady and often unremarkable gains on City sets and like it that way. If you look at City's 15.79% CAGR and then throw out the humdrum police and fire sets, you *might* begin to see that some of the more unique sets in this theme seem to do rather well, even though it is an unlicensed theme and whole subthemes are under threat of a refresh at any given time. That does mean a savvy investor has to be always on the lookout for rumors and leaks of future themes/sets so product can be moved when necessary, but that is a risk I'm willing to take. I don't wish I had fifty of these, partly because I don't have that kind of capital to tie up in a single set and partly because even if this set is $250-275 CAD next Christmas I don't know if I could quickly find a home for so many at once (and I rely on regular sales to keep the investing side of the machine running), but I do wish I had about 10-15. So, what can we learn by looking at a slow, steady gainer eleven months post-EOL? Hopefully something to help us make better choices going forward. I know I buy much more selectively now than a few years ago, and I try to find a comfortable little niche where I can buy-sell-rinse-repeat enough to keep money coming in and a smile on my face. Perhaps you'd like to join me? This is one of those "under the radar" sets" that gets little love from collectors, but smart resellers know they are money in the bank. We talked about it quite a bit here. Well you're right about collectors not showing much loved for this set. UK eBay sales for the last three months stand at six. This, along with The Mine, was one of my first investment purchases ever after coming out of my long Dark Ages. My buy in was $89. It looks like I picked a winner. For those that have been in this for a while, are you holding onto this investment anticipating it will continue to rise (and that it is unlikely that Lego will make another remake of this soon) or are you selling it now that it has made the gains this past year? This set was available Black Friday 2013 at TRU for $75 (not counting discounts, rewards, coupons, etc). I would not expect huge gains past where it is now. Some are probably selling, some are probably sitting on them. It's really up to you. I think more in Black Friday/Daily Deal threads, but definitely not as much in its own thread. 1) The statue is a unique and attractive change to the city sets we'd seen until this one. That second point is important because it means there is something different about this set. That street sweeper tractor isn't the best design but it's a small model and its NOT a helicopter! Real LEGO fans will appreciate how different this set really is from it's predecessors - i.e. 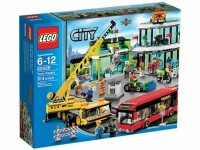 regular LEGO City.sets! Brickset.com lists its availability from Aug 1, 2013 to December 2014. Perhaps to refresh it WITH at helicopter or two. Preferably a police or fire one! I kept a couple, bought at good discount. Kept for about a year and then sold them off 6 months after retirement. Net profit is 25% of cost price. Not too bad, slightly below average amongst the sets that i invest in. I would not keep this set for long, as it does not have upside potential like sw or modular. Just a quick flip post retirement. You don't think so? I only have 1 to sell, but I could see this one going up a bit if we could wait a couple more years. I was happy to sell the City Garage (7642) for $140 a few years back when I first started and it's now over $350 on Amazon. I don't have high hopes for most City sets, but this and the newer City Square might be two of my favorites. You have me craving Wendy's. I totally forgot about that. Which surprised me, because my waist reminds me every day about how much Wendy's I was eating last year. When factoring in gas, wear and tear on the car and such in your spreadsheeting (to please some members on BP), you also need a column to account for 'delciousness' or 'needs met'.